It was rather an unpopular choice of replacement, and there was much muttering about how things wouldn’t be the same. The longer you do a job, the harder you are to replace. But that’s enough about Top Gear. For a lead singer to be able to replace Brian Johnson, they had to be their own man, but be respectful of what had gone before. Someone who had star quality, but could keep themselves in check in order to be part of a bigger team. Many doubted that W. Axl Rose could be that man. Too egotistical they said. Not enough of a work ethic. Too spoiled. Not a team player. Too…bad at turning up on time. It would have been the equivalent to Leicester City signing Ibrahimovic in the January transfer window – a talented individual perhaps upsetting a team. But last night’s show was a lesson in how Axl has matured and has conquered whatever demons he had that made him turn up three hours late to everything. Around the stadium there was a palpable sense of anticipation. The merchandise stalls were ten deep all day, selling a dozen types of t-shirt and Angus Young school ties for £15 a pop. We were so surrounded by flashing devil horns that it resembled a slightly twisted Coldplay concert. But none of this ruffled Axl. Onstage with Guns n Roses there’s more pressure on Axl to run the show, but as part of AC/DC, Axl knows that the pressure is off. 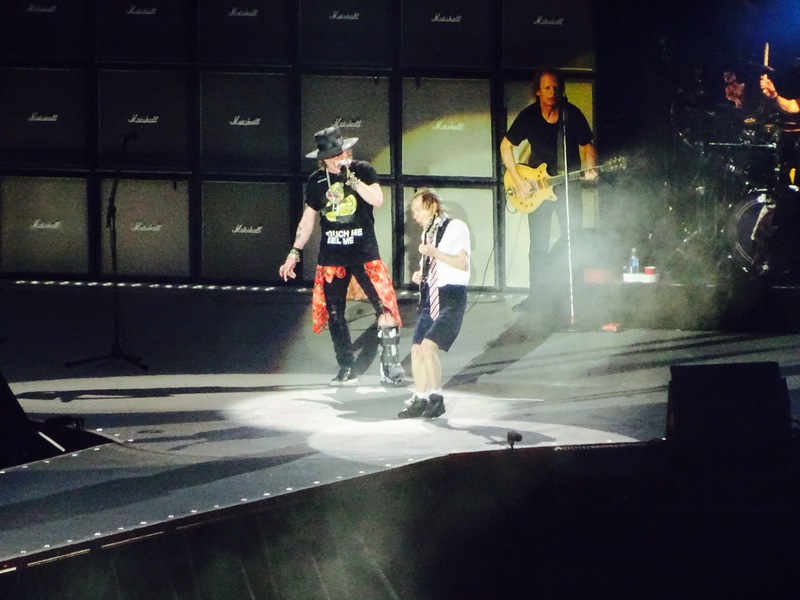 Because an AC/DC show is all about Angus Young and the band behind him, and Axl generously gave Angus all the spotlight he needed, and concentrated on hitting the high notes – which he did admirably. The show began with some bona fide classics. When Shoot To Thrill, Hell Ain’t A Bad Place To Be (which somehow Axl sang as “Ain’t No Bad Place To Be” – perhaps his most obvious tweaking of a song) and Back In Black comprise three of your four opening songs you know this is some catalogue. “Rock and Roll Damnation” was a welcome Powerage-era addition to the set list. “Thunderstruck” got a particularly strong response from the crowd, suggesting that of all the post Mutt Lange Beano era songs this is the pick of the bunch. Axl sang strongly throughout, his inter-song banter was subdued compared with his raps at a typical Guns n Roses show and Angus Young eased his way in, only shedding a tie half way through the set. Yet it wasn’t until Angus shifted up a few gears that the show really came to life. 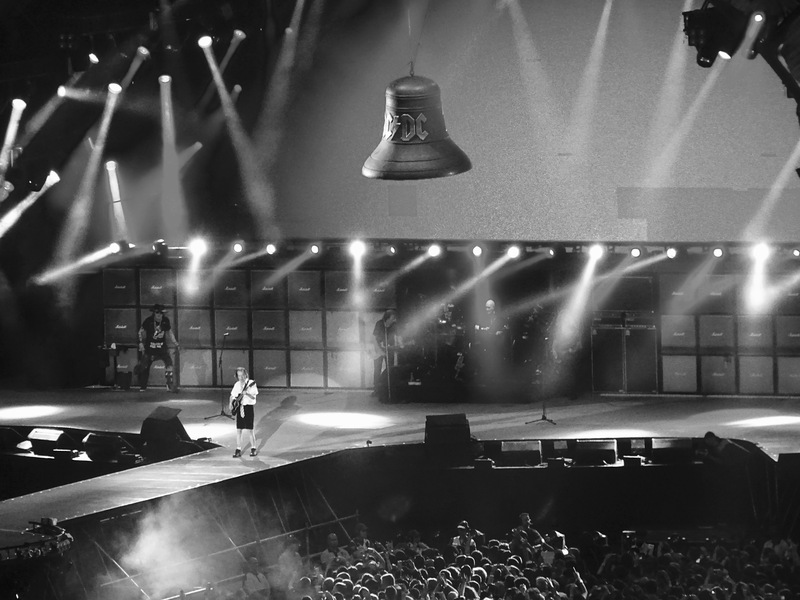 “Hells Bells” led to the first of the famous props to show, “If You Want Blood…” was a fine reminder of the power of the band at full tilt and “You Shook Me All Night Long” went down a storm. But it was during Whole Lotta Rosie and Let There Be Rock that Angus rolled back the years and showed us all just why this band is so special. Compared with the Angus Young of the seventies, as captured on the Let There Be Rock video, he may be just a little less manic, but this is a minor quibble. For the last third of the show Angus was everywhere, throwing himself to the floor, duck-walking on top of the speaker cabinets and generally being Angus. It’s a joy, and if it sounds slightly uncomfortable to say that watching a sixty one year old man cavorting around in a schoolboy uniform playing guitar is something everyone should witness, nevertheless it’s a fact. And as for Axl Rose? 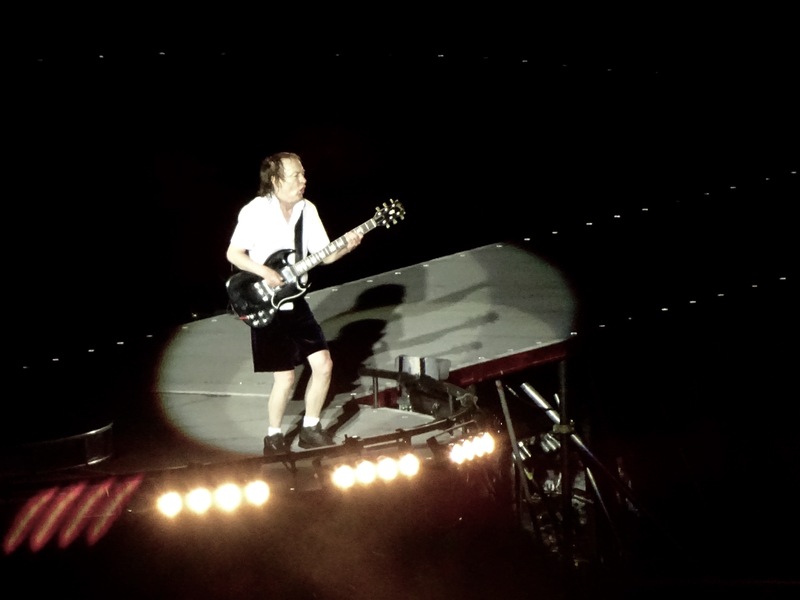 The AC/DC front man position is possibly the greatest job in the world. You get to play with one of rock’s greatest schoolboys, you get to ring a massive bell and fire a massive gun, and you also get to sing AC/DC songs to an adoring crowd. He’s having a great time. The pressure’s off, and the best compliment I can pay him is that it didn’t seem so strange to see him there. He still wore a leg brace from an earlier injury sustained on the eve of the tour, but was lively enough. Axl Rose the team player? Truly, I’ve seen it all now…. Yup. We were there and that’s how it was. ACE. 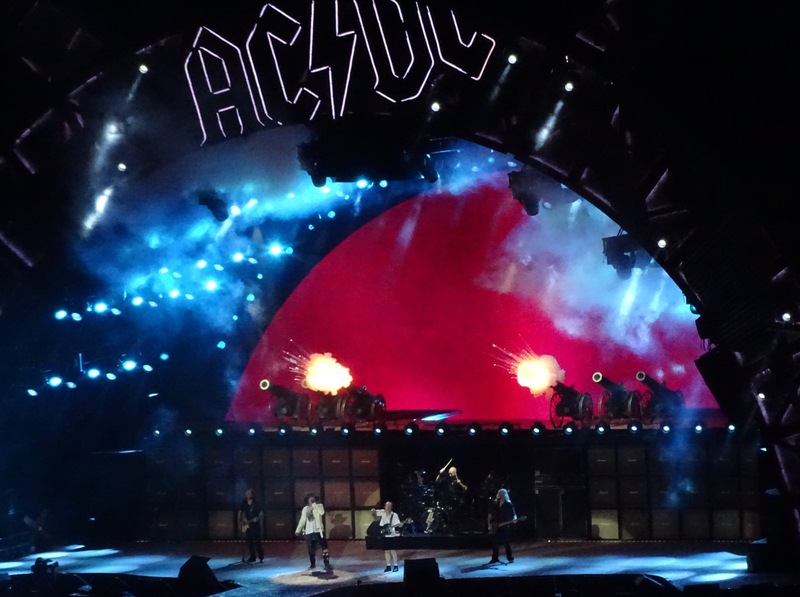 Nice to talk to ‘old school’ AC/DC fans on the Tube who were honestly surprised and pleased by how well Axl performed. From what I’ve seen from all the YouTube Clips that the fans have been uploading from Lisborn to Düsseldorf; the band looks incredibly energized. Axl and ACDC are a perfect match! 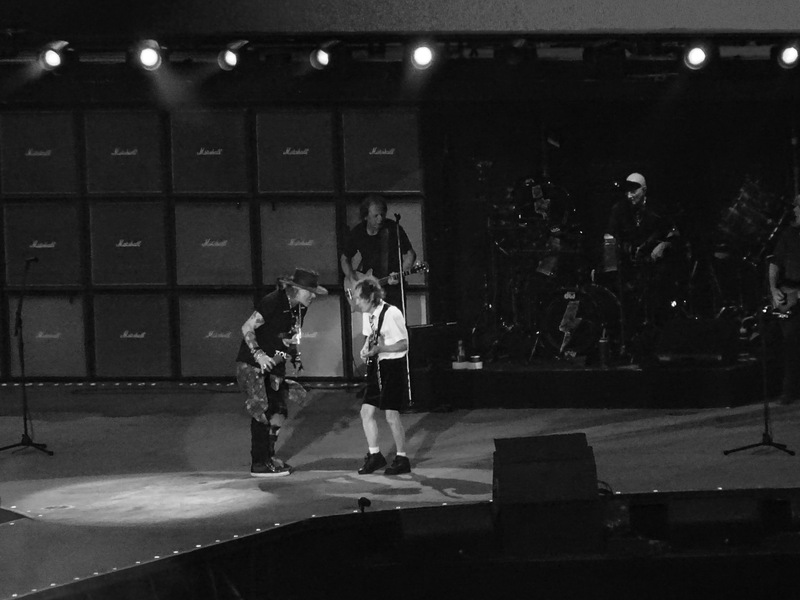 Axl has an enormous amount of respect for ACDC and in particular for Angus. 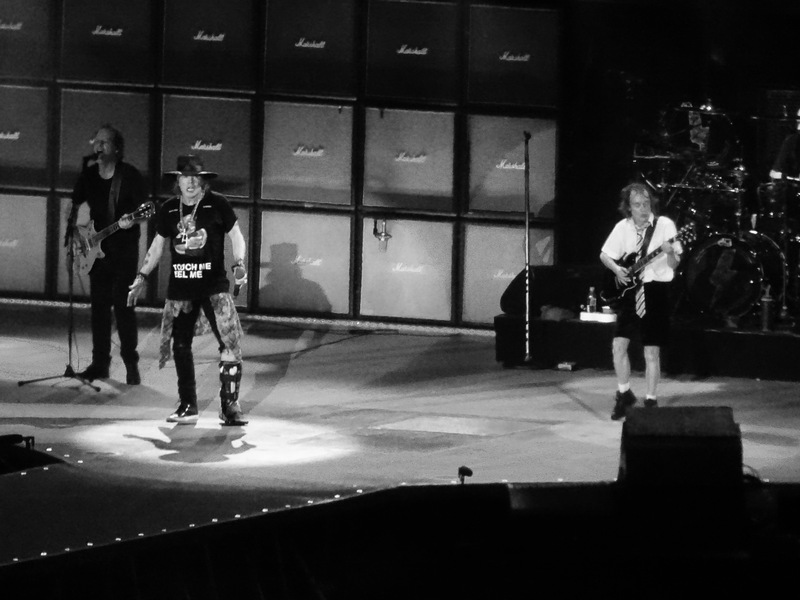 You can see the band is having fun and both Axl and Angus are really enjoying each other’s company on stage. Axl is having a ball up there and I’m sure he’s pinching himself at the realization of fronting the worlds best Rock & Roll band. I personally think he should remain the new frontman. Both Bon & Brian are an important part of the ACDC History and now it’s time for a new chapter in the ACDC story. The combination of Axl’s lyrics and Angus’s rythum & blues music would be a perfect combination moving forward. I can proudly say that I’ve known Angus since we were 12, both of us attending Ashfield Boys High School until we completed our School Certificate’s at the end of 4th year (1970). I feel really happy for the band and in particular for Angus & Malcolm. God Bless Malcolm & may God Bless ACDC for both now and into their future.